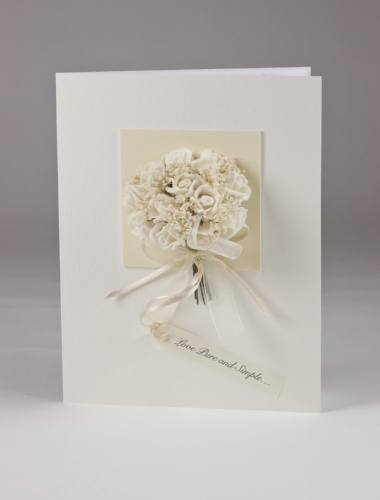 Designed and hand made in London, Karrie Barron Cards specialise in luxury Wedding Stationery. From bespoke invitations, RSVP's, and place settings, to personalised cards for the Bride and Groom. Get in touch by filling out the form below and we will get back to you to discuss your specific requirements as soon as possible. Each card is individually hand made by expert craftswomen in our London studio. We use the finest materials including dried gypsophilia, satin and organza ribbons, dried roses, eco friendly card and paper, all sourced and produced in the UK. The quality and attention to detail of our work is second to none. Available in an assortment of colours to suit any colour scheme. Each invitation comes wrapped in tissue paper in a presentation box, tied with a coordinated satin ribbon bow. The paper insert inside the card is printed to your requirements, along with the label on the front of the card. We provide RSVP's with menu options. We will handle the delivery of each invitation to its recipient via tracked delivery for only £3.50 a parcel. Prices start at £8 per card for this design, and as little as £5 for other designs.